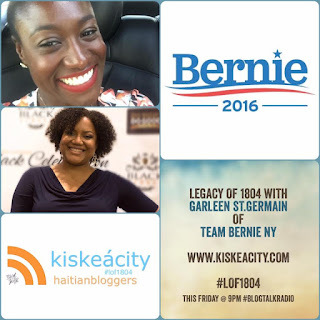 Host Alice Backer of www.kiskeacity.com welcomes Garleen St.Germain, a Haitian-American organizer at Team Bernie NY who has been volunteering for the Bernie Sanders campaign for about a year. How do Bernie Sanders supporters and sympathizers help get out the vote in New York? Great opportunity to discuss how to canvas in general and in the Haitian community in particular, phone bank, organize events and more. Have questions about other states? We'll do our best to answer them too. Link to listen live: http://www.blogtalkradio.com/pancaribbean/2016/03/19/legacy-of-1804-with-garleen-stgermain-of-team-bernie-ny-lof1804. Or listen live on the phone at (714) 242-6119.